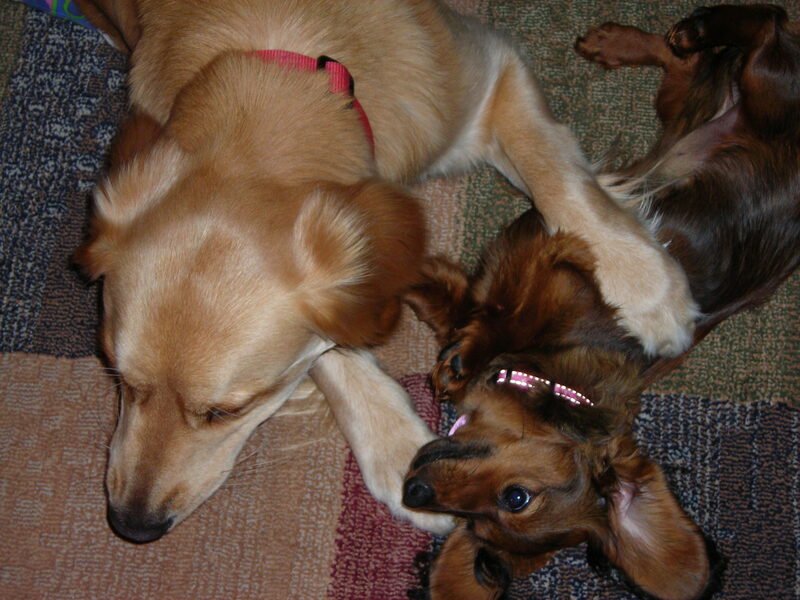 Sophie pins Zoey during a play wrestling match. During the weekend at Mommy’s dad’s house, I got to play with my friend Sophie, a golden retriever. We had to sniff each other, despite meeting a few day’s ago, to get an update on what yards we’ve dug into and naughty things we’ve done. Sophie dug up some flowers and chased balls. I just had a bath, so I wasn’t as easy to read. After taking care of the first course of business, we touched noses. Yes, let’s play we said as we wagged our tails. I ran and looked behind me to see Sophie skipping up to me. I stopped and did my play bow with my front paws bent at the elbow and my behind in the air. Sophie did hers. We wrestled, and we chased. We rolled, or I did, as Sophie licked the top of my head. She pushed at me, making me move across the floor in a slow slide. I hopped back. And we got started in our wrestling match. I won – mainly because I could become the bigger dog by sitting on chairs, couches and people’s laps and looking down at Sophie. Needless to say, I had the advantage. I heard Mommy tell her dad she was proud of me. “She’s usually scared of big dogs,” Mommy said. And off we went, Sophie and I, to explore my backyard. I showed her the digging spots and the place under the tree where the branches umbrella over the ground. It’s a great shady hideaway. We touched noses and communicated with barks and sniffing and, off I go, chase me. And she did. She saw Zoey run. And man can I run! My mommy put my food dish, a bag of my food and my toys, including Bunny and Lenny the leopard, into a canvas bag. What are you doing? What are you doing? I repeated in my barking as I ran around Mommy’s legs. Mommy went outside with my bag and her bags, shutting me out of the outdoors. I jumped up on my chair and looked out the picture window in the living room window. Mommy, see me here! I wagged my tail as she came back to the door. I jumped off the chair and circled around her feet. Take me! And she did after saying goodbye to her mommy. We drove in a car for a really, really long time, but it didn’t seem too long after I decided to sleep on Mommy’s lap. We arrived in another place and Mommy’s dad, who I met before many times, gave Mommy a hug. “Hi sweetie,” he said to me. I smiled my doggy smile back and wagged my tail. He petted me like I asked. He carried me while Mommy carried her stuff into another house that wasn’t mine. Mommy’s brother and a girl who said I was cute and petted me, too, were there. And so was Sophie! Sophie’s my new friend, a 1-year-old golden retriever, who I met a few days before. We touched noses and ran and ran and played and I rolled onto my back. I know I’m the smaller dog and am supposed to be submissive. And I did do that. I don’t like it when Shelley leaves me for long hours at a time. She leaves with a black bag instead of the white bag she uses to carry me around when I want to see the world, something that is hard with my short legs. Doesn’t she know that I am a puppy and need guidance, love and care to grow up into a well-behaved dog? As she leaves me, I watch out the window with a sad look on my face. I’ve heard my look called puppy eyes, something that doesn’t make sense. I’m a puppy and I have eyes. I feel different things, so no matter what I’m feeling, I have my puppy eyes. I strain my head to see her as she climbs into the car. Please, please put your black bag away and come back to me. My second mom doesn’t like all of my barking at noises, passing cars and potential friends. She doesn’t like it when I want to go outside to check out the smells and come back inside to search out … oh, is Second Mom eating? I can tell when I’ve pushed my limits (I’m a miniature dachshund and we, as a breed, like to be manipulative and show our strong wills). I usually jump up on Second Mom’s lap (as long as she’s sitting) and give her a half-dozen kisses to tell her sorry. Second Mom starts laughing at the kisses, and then I know things are all right, at least until I’m naughty again. My new fashion accessory makes straw chewing difficult. I got surgery when I was eight months old. I had to get my right elbow fixed. I normally like going to the vet, because I get told how cute I am. I wiggle my behind and roll onto my back into my pet-me position. How can Dr. Adams resist? I even overheard him telling Mommy that I’m one of his favorites. He said I’m a sweetie, and he doesn’t mind having me around all day if Mommy has to go to work – like when she drops me off in the mornings when I have to get my shots. Dr. Adams, however, was not my favorite on August 20, 2009. He gave me a shot, and I don’t remember anything except waking up real groggy. I didn’t even care about cuteness comments and getting pets. I just wanted to sleep, and I didn’t eat. I slept all day long. And then I got wrapped up in a blanket and carried out to Mommy. “She looks so glassy eyed,” Mommy said to Dr. Adams as I got transferred into her arms. Mommy and Dr. Adams talked. I tried to listen and keep my eyes open, but I fell asleep until I got taken to the car, where I slept some more. When we got home, Mommy made me sleep in the cage for three days despite my trauma, despite my crying and very clear message that I wanted to return to my real bed. 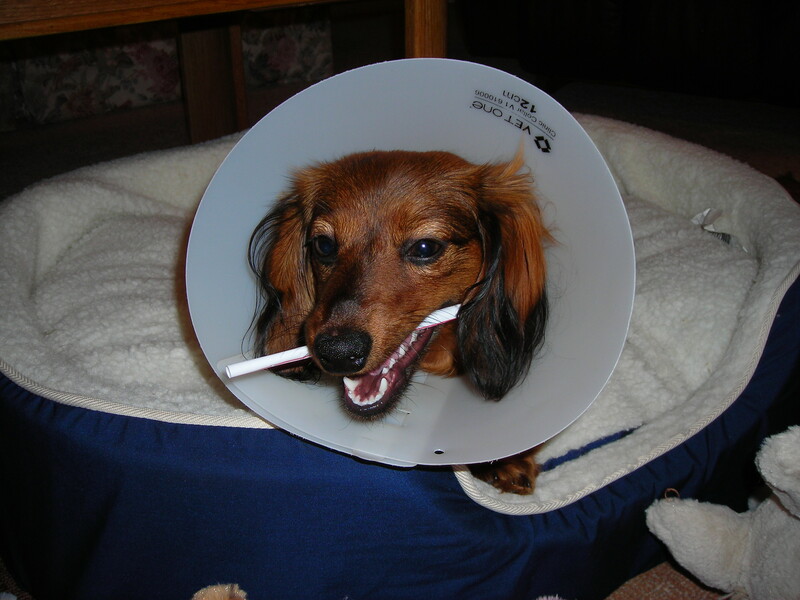 What’s worse is that I had to wear a cone thing on my head that stuck out, making me look half plastic-half dog. Overall, I do not understand the point of that particular vet visit, but now I don’t limp and I can run faster. See Zoey. See Zoey run. See Zoey peel out as she chases cars, birds and feral cats.